Europe and the United States must take their share of blame for instigating crises that force people to flee. But then, the nightmare began. After a seven-day voyage across the Red Sea in a ramshackle wooden boat, he landed in Sudan—and into hell. Beaten, abused, thrown into jail and out again, he fell into the web of human smugglers. He travelled to Libya, crossing the scorching Sahara Desert in an open, jam-packed truck for three weeks. “It was a nightmare. No food—and worse, no water–for days in terrible heat,” he says. Eventually, he crossed the Mediterranean Sea into Europe in a crammed, heaving dinghy that began listing dangerously. They would have drowned had not an NGO ship rescued them and taken them to Porto Empedoclo in Sicily in southern Italy. Authorities may grant asylum as he is fleeing war. But Ismael from Niger will most likely be sent back. He came to Europe in a creaky boat with standing room only, after spending months in a teeming, filthy Libyan camp where he was sodomised by the armed traffickers. Conditions were so unhygienic, he contracted scabies. He is fleeing poverty. Europe does not give refuge to illegal economic migrants. 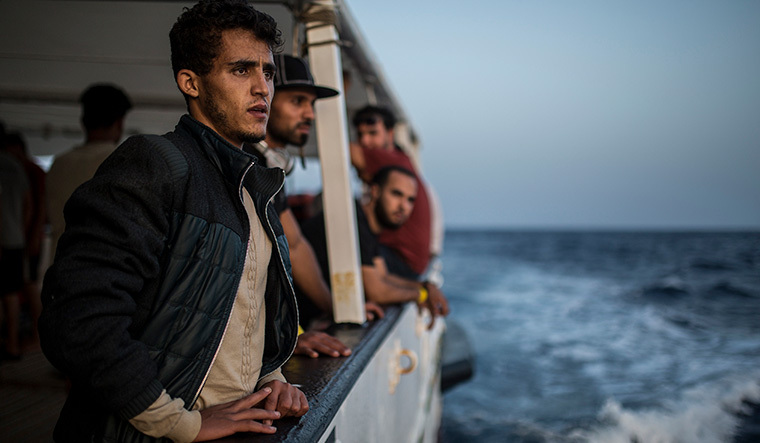 Omar and Ismael are lucky: 2,500 refugees drowned during the risky voyage this year. But 45,000 managed to land on European shores, smuggled across the Mediterranean from Libya, Turkey, Morocco in precarious boats, hapless human cargo of vicious human trafficking, reminiscent of the African slave trade centuries ago. Families incur debts to pay $500 to $1000 for this perilous journey into Europe, where some wind up as indentured prostitutes, pimps and drug peddlers for local mafia. Rising public resentment against migrants fuels left and right wing populism across Europe, threatening elites and disrupting mainstream parties. Without any trace of irony, Austrian farmer Otto Scheikl—who supports the far right Freedom Party of Austria (FPO), which is now in the ruling coalition—says, “We are pro-migrants. We want them to go back to their own countries.” Located in southern Europe on the Mediterranean, Italy bears the brunt of refugee arrivals. After recent elections, a coalition of left and right wing anti-immigrant populists are in power. Ironically, even Merkel, the pillar of European stability, is shaky, her federal coalition teetering. Like a machete, migration has cleaved the 70-year solidarity between Merkel’s Christian Democratic Union of Germany (CDU) and its Bavarian ally Christian Social Union (CSU), which faces an existential threat in the forthcoming provincial elections from the increasingly popular anti-immigrant far right Alternative for Germany (AfD). Migration is a boiling issue in Bavaria, which has seen large refugee inflows as it borders Austria, Czech and Switzerland. 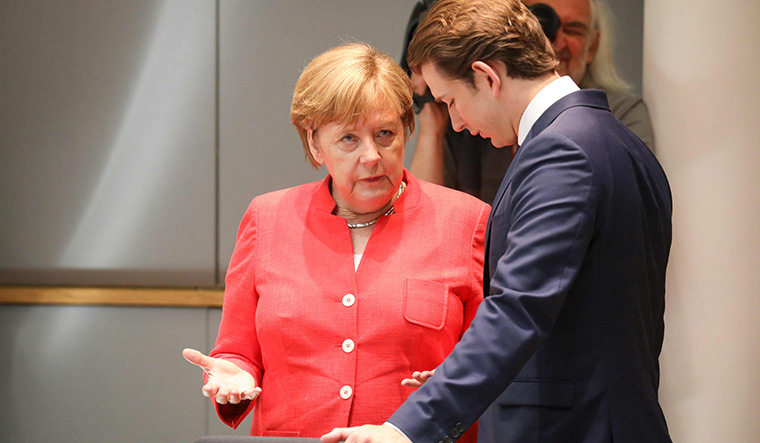 CSU demands that refugees be sent back from the German border to their European port of arrival, which is usually the southern EU states—Italy, Spain and Greece. Quarrelling European countries offer irreconcilable solutions to the migration problem. But after a recent marathon all-night EU summit that had veteran heads of nations yawning widely, fatigued deputies forcibly widening eyes to stay awake and stressed aides scratching their heads to find harmonious words, a solution package emerged at 4:35am. Incredibly, all 28 member states returned to their capitals, exhausted but happy. The multi-pronged solution includes establishing refugee centres in regions of origin in West Asia and North Africa, intensifying coastal patrolling to foil migrants from leaving their shores, tightening Europe’s borders to prevent them from entering, establishing voluntary reception camps across the continent to sift asylum seekers from economic migrants who succeeded in slipping in and blocking refugees from crossing Europe’s internal borders. The EU also recognises the need to invest more to create better living conditions in Africa to ensure that people do not flee. If war and poverty were not existential threats, most refugees would prefer to live in their own homelands. Often unimplementable, please-all solutions please none. But one should not underestimate Merkel’s pragmatic, low key, painstaking, solution-oriented methods that do not grab headlines, but fixes problems. Says Alex Stubb, Finland’s former Prime Minister, “I have never, ever, seen anyone able to negotiate her way through difficult situations with such calmness.” A vital factor for the dramatic drop in migrant inflows after 2015 was Merkel’s Euro 3 billion deal with Turkey to prevent Afghan and Syrian migrants from leaving its shores. Now Spain and debt-laden Greece volunteers to accept more migrants. Others, facing labour shortage due to falling birth rates, will follow. The EU negotiations showcase how governments ought to resolve problems: long, laborious, complex discussions aiming for compromise and consensus, a la successful marriages; in stark contrast to quick, unilateral, racy tweets threatening war, heralding peace or boasting stronger alliances after one-night stands. Europe and the United States must take their share of blame for instigating crises that force people to flee. Imagine a world if western conglomerates did not bribe local governments for extracting natural resources, if there were no western tax havens for corrupt dictators to park their loot, if there were fairer trade policies, and above all, if the United States and Europe did not wage, abet or support wars in Iraq, Syria, Afghanistan, Libya. Omar and Ismael are innocent victims, born in the wrong country at the wrong time, now huddled in a European refugee camp, battling fear and uncertainty, hope and despair. Omar bites his nails in nervous anticipation, but a broken Ismael is losing his will to live. He knows, back in Niger, he will be claimed by poverty or gang violence.